Budget friendly farmhouse decor ideas are on a lot of peoples mind this time of the year. It just turned 2019 and many of us are stuck inside during the cold winter. 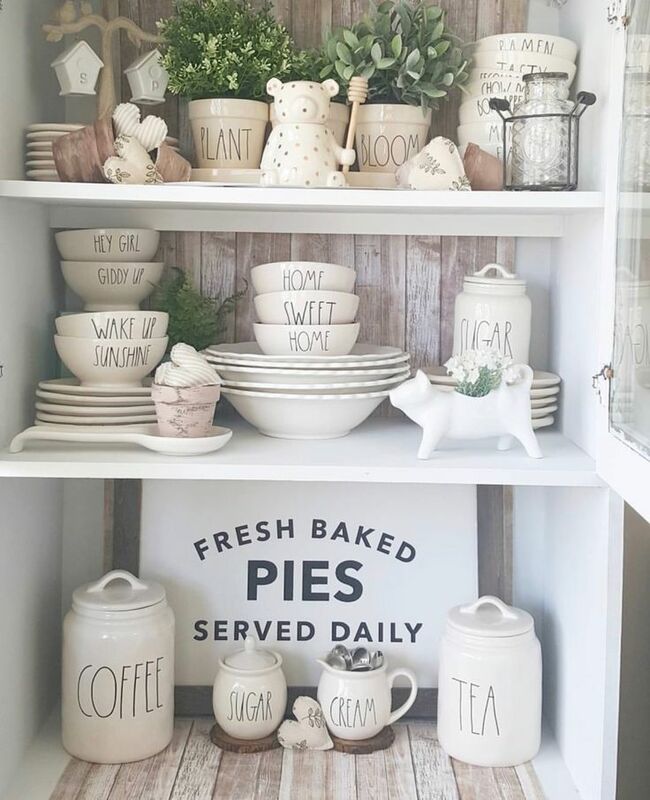 So we decided to explore 80 of the most popular budget friendly farmhouse decor ideas you will see in 2019. On our tour we are going to explore simple up-cycling ideas for kitchen and bedroom. We will also check out a number of popular farmhouse wall decor signs on our journey. So why not grab a cup of your favorite warm drink and curl up while we explore our favorite budget friendly farmhouse decor ideas for 2019. These are all Pin worthy ideas so we invite you to save a few or a lot….Enjoy! We’ve enjoyed bringing you this collection of 80 budget friendly farmhouse decor ideas for 2019 and beyond. We hope you try a few of these ideas and let us know how they went for you. Until next time…Stay Crafty! If you’re planning a rustic 2019 wedding then you need to see our collection of rustic lantern centerpieces for bridal shower ideas. It’s such an exciting time and bridal shower centerpiece ideas can bring magic to your shower decor. We went through our own collections and searched top wedding blogs for some great rustic lantern centerpiece ideas and here are the best of what we found. If you like the DIY approach then this collection of natural twigs combined with some lace might be the perfect combination when you accent them around a rustic style candle lantern. Create a touch of rustic elegance with wood slab chargers under a vintage silver candle lantern. Add coordinated flowers and use engagement photos as base for the table numbers. Use rose gold lanterns and fill to the top with tea roses like this example. Want a more rustic look? Why not decorate with classic wooden candle lanterns. Getting married during the cooler seasons? Why not try classic centerpieces, dressed up with greens, berries, flowers and candles. These timeless Moroccan style centerpieces encourage great conversation throughout the evening. Try a smaller lantern with a splash of green and a few blooms. Blush tones combined with cream colors create an elegant feeling in this vintage style centerpiece. Use a hexagonal vintage candle lantern to take this look over the top. This lantern design combines different colors with a variety of floral colors to create more of a vibrant beach wedding vibe. Working with an all white pallet? Why not jazz things up with vibrant flower clusters and a variety of white candle lanterns. Anyone else dreaming of a glam camp wedding? Who knew moss could be so chic—just add candles. Want to keep things simple? Try a collection of silver candle lanterns in differing heights with just a touch of baby’s breath. Herbs, flowers, and a bit of greenery combine with these unique candle lanterns to create a whimsical feel. Just add some hand painted table numbers to create your unique table centerpieces. Metallic brass is gorgeous in its own way, when you combine it with the soft glow of creamy candles and ivory floral’s, it creates an über-romantic ambiance. Want to create a free-spirited look and feel. Try combining Moroccan lanterns and rugs with woven pillows and varied furniture. Try combining clean smooth lines of modern black candle lanterns with warm inviting wood elements for a classy combination. Create simple elegance with a minimal rustic tin frame candle lantern and simple pillar candle wrapped in burlap ribbon. Combine a wooden candle lantern of your choice with a wreath of babies breaths or similar light colored flowers for an elegant centerpiece. Start with a rustic black candle lantern of your choice and surround the base with a collection of white and pink carnations. Looking for the perfect centerpiece idea if you plans are for purple or lavender flowers? Classic black is the perfect match-up and nothing says classy like these tall candle lanterns. It’s time to wrap up our tour of the 19 Best Rustic Lantern Centerpieces For Bridal Shower 2019. We hope this has inspired you and we want to with you the very best of 2019. We would love to hear from you, especially if you are planning a 2019 wedding!